Ceiling fans are a unique appliance. Apart from being practical, they also add an aesthetic value to a room. They are a source of comfort and décor at the same time. 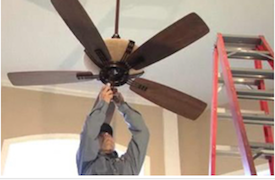 So, when it comes to installing a ceiling fan, a homeowner needs the skills of an expert electrician. While many homeowners consider ceiling fan installation a do-it-yourself project, it is easier and safer to call a professional. The installation of a ceiling fan calls for extensive knowledge of electrical wiring, in addition to proper handling of a heavy object. This is why we suggest that you leave the work of installing your ceiling fan to the certified and licensed electricians of the Best Fishers Electricians! We are a team of certified and licensed engineers who have been insured to work with home appliances. We work with absolute dedication, prioritizing safety and energy-efficiency. We are a reliable, competent, and professionally-trained team of electricians, each of whom is qualified to work in your home with clear background checks. Top-notch results are guaranteed. Our electricians deliver high-quality repair and installation services at reasonable prices. We are masters of wiring and installation; you will never find a wobbly fixture or an improperly wired appliance. The Best Fishers Electricians team is also available to answer any questions that you may have regarding any other electrical needs. We believe in open and transparent communication with our clients, and for this reason we will tell you honestly what we think of your electrical wiring design and how it can be improved. 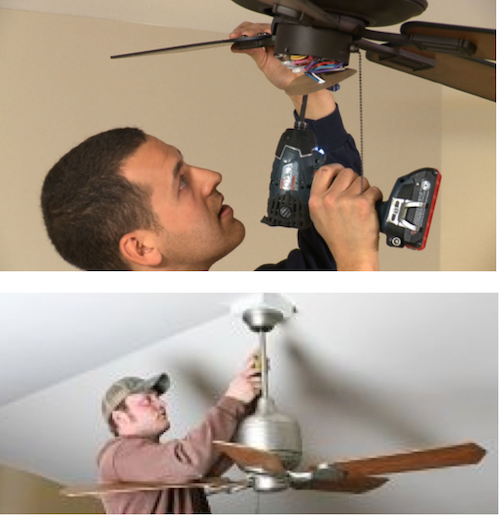 The Best Fishers Electricians team has been trained to deal with different makes and models of ceiling fans. We are professionals you can trust when it comes to dealing with appliances. Be it commercial or residential, we have your electrical service, repair, and installation needs covered. For a safe installation, the blades of the fan must be aligned with each other. We will also use our expertise to advise you about the location of the fan according to the amount of weight it can bear and the wiring structure. If you need help re-installing a fan that has been installed improperly in the past, our balancing kits come to your rescue! With the help of our state-of-the-art tools, we can assist with all your electrical needs. Taking customer satisfaction and safety as our prime goal, we strive to make every building—residential or commercial—a safe and energy-efficient place. Give Best Fishers Electricians a chance to serve you with our best-in-class service.